Chrome Remote Desktop is a new Chrome extension that lets you remotely control a computer from your browser. It’s the first software that uses a technology code-named “chromoting” and it’s especially useful if you have a Chromebook. The goal of this beta release is to demonstrate the core Chrome Remoting technology and get feedback from users. This version enables users to share with or get access to another computer by providing a one-time authentication code. Access is given only to the specific person the user identifies for one time only, and the sharing session is fully secured. One potential use of this version is the remote IT helpdesk case. 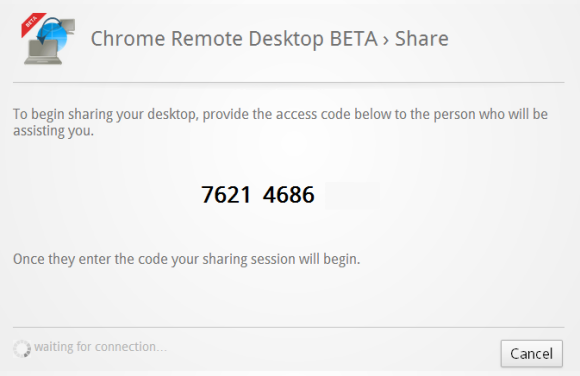 The helpdesk can use the Chrome Remote Desktop BETA to help another user, while conversely a user can receive help by setting up a sharing session without leaving their desk. Additional use cases such as being able to access your own computer remotely are coming soon. Chrome Remote Desktop BETA is fully cross-platform, so you can connect any two computers that have a Chrome browser, including Windows, Linux, Mac and Chromebooks. I’ve installed the extension on a Dell laptop that runs Windows 7 and on a Samsung Chromebook. The extension has more than 17 MB, so you have to wait a little bit until it’s downloaded and installed. After installing the extension on my Dell laptop, I clicked the new icon from the new tab page and Chrome Remote Desktop asked me to “grant extended access permissions” to my computer. 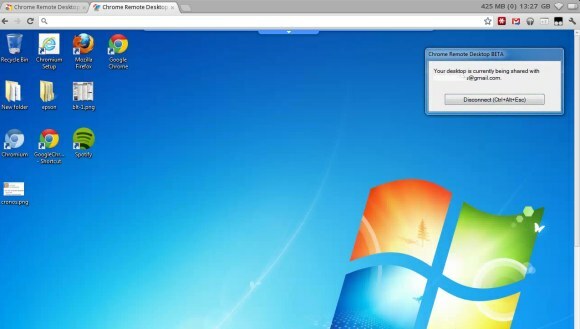 Chrome Remote Desktop is a special extension because it can be used to control your computer. 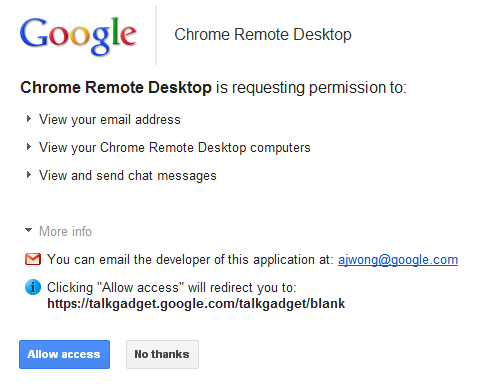 It’s interesting that the extension uses Google Talk’s technology to send messages. When you decide to share your computer, Remote Desktop generates a code you need to enter on a second computer. The performance is pretty good, but it depends on your Internet connection and the computers you’re using. The extension is especially useful for businesses and it will make Chromebooks even more attractive for companies.